February 4, 2015 – Hearts are already on our mind during the love-filled month of February, but it’s also American Heart Month! Today we’re sharing our favorite tips and tricks to eat your way to better heart health and recipes to help you get there. Tip 1: Eat a diet rich in vegetables, fruits, whole grains and fiber. A fun way to incorporate more produce into your diet is to eat foods that represent every color of the rainbow! A colorful plate is sure to bring lots of nutrients with it. 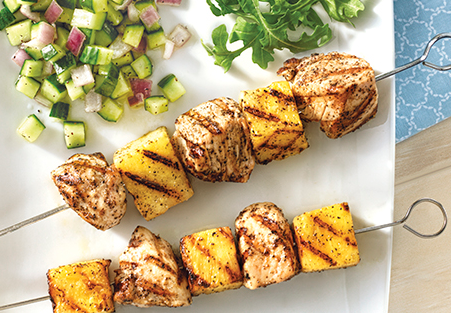 This recipe for Grilled Chicken and Pineapple Skewers with Lemon-Cucumber Salsa is a perfect way to incorporate fruits and veggies into a filling meal. Tip 2: Select fat-free or 1% fat milk and low-fat dairy products such as yogurt and cheeses. Tip 3: When fresh produce isn’t available, frozen or canned vegetables and fruits in water without added sugars, saturated fat and trans-fat or salt are a great alternative. Try this Cowboy Chopped Salad that uses a mix of fresh, frozen and canned veggies for maximum flavor. Tip 4: When choosing packaged, processed, or prepared foods, compare food labels and choose the product with the least amount of sodium. Tip 5: Try to incorporate fish into your meal planning at least twice a week. Many fish selections are a good source of omega-3 fatty acids which help protect the heart. 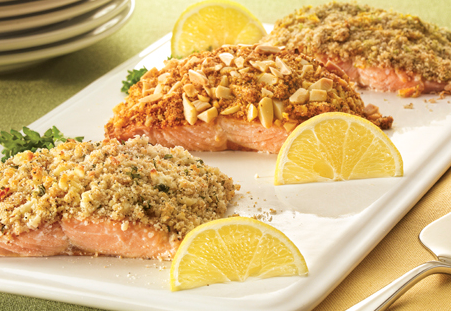 This Crusted Salmon recipe from the ALDI Test Kitchen allows for some flavor creativity with three ways to take your fish dish up a notch. Tip 6: Limit your consumption of saturated fat and cholesterol. Tip 7: Try to cut back on foods containing partially hydrogenated vegetable oils to reduce trans-fat in your diet. Tip 8: Limit your salt intake by using herbs, spices and vinegars to add flavor to your recipes. These Roasted Spiced Almonds are a sweet and spicy, protein-filled snack. Hi LaRae, please please contact Customer Service at http://bit.ly/aldicustserv for assistance. wanted to thank you for the cooking ideas, recipes, great affordable food, and product lines, I have lost almost 80 lbs eating Fit & Active meals and your reasonable fruits and veggies, I too share your info on my blog and FB page! Wow, Heather!! 80#?! Awesome for you! I also really enjoy the Fit and Active products and have lost 40#, combining these food choices with 30 minutes of exercise 6 days/week. I LOVE the Fit and Active protein bars because I can get a chocolately treat with lots of protein. A very satisfying afternoon snack. Thanx ALDI! !